Fits all 1965-1968 Big-Block Chevy passenger cars, 1966-1972 trucks and 1969-1970 Big-Block Corvettes. Has 3/4" ball/ball bearing. Dimension from block surface to hub: 5-3/4"
Using state-of-the-art racing technology, Edelbrock "super cooling" Victor Series aluminum water pumps are designed to provide maximum flow, maximum pressure and equal distribution to both sides of the block within 1%. Available for most popular applications, these high-performance pumps flow in only one direction for optimum efficiency. The casting's computer-designed internal passages and CNC-machined cast iron impeller produce the maximum flow rate possible. Water pump features include: aircraft industry clearances; heavy-duty 3/4" integral ball/roller bearings and billet steel hubs. 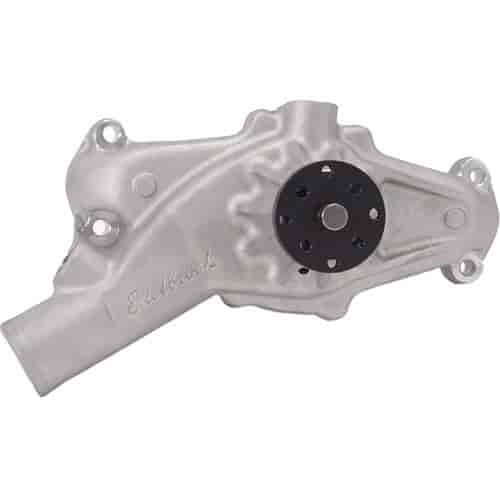 All Edelbrock Chevrolet water pumps that may be used in race applications have a unique O-ring that provides a far superior seal than conventional gaskets. This exclusive O-ring minimizes clearance and maximizes flow for racing and heavy-duty applications. All Victor Series high-performance aluminum water pumps are extremely durable as well as efficient. Click here to choose the correct water pump you need. Click here to see the internal make up of the Victor Series Water Pumps! Does Edelbrock 8850 fit your vehicle?